My mother's church in San Francisco was called St. Brigid's, my church was called St. Catherine's, I was told I had the map of Ireland on my face, said "Mither, I want me mush" when I was a kid, my best friend in kindergarten was called Kathleen Ahern, I went to parochial school, wore a navy blue uniform and beanie, had priests called Monsignor Burke, Father Cushnahan, and Father Coffey in our parish, my smart girl rival in Catholic school was Marleen Dunne, Paul and Philip Murphy, the twins, were the milk boys at school, Darragh Flynn could run faster than me, I collected holy cards, hoarded silver dollars in my sock, was sexually repressed, committed minor sins but still thought I was going straight to hell, took the "pledge" when young, I think, I forget, I had an alcoholic uncle who was the family secret, I had very pale skin, blue eyes and dark hair, my childhood enemy was Marylou Mahoney down the street, her mother thought I was the ringleader against her daughter, I wore green on March 17th, said I was "English, Irish, and Scottish" when asked what I was, I went to Mass every Sunday, knelt down before the radio for rosary recitation, I sunburnt to a crisp, had a spinster schoolteacher aunt called Agnes, I never thought of going to Ireland, but went to France three times, my mother was a dyed-in-the-wool Democrat, feisty politico, go-straight-to-the-top type woman, her son was favored over three daughters, I love potatoes and sweets, and often feel I'm starving--that's everything Irish about me in a nutshell--except I'm always running late, love to chat, and I am a poet. Cover art: An adaptation of the initial "D" from Collectio Canonum, Cologne Cathedral Library, Germany. Copyright at Classic Designs, Ltd., 1992; reproduced with permission by L.J. Young pubsher, The Mills, Blarney, Co. Cork, Ireland. 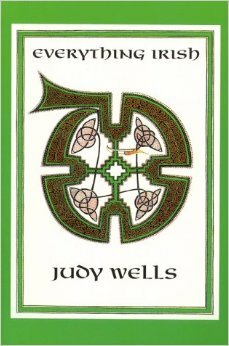 Judy was featured at the 2014 11th Annual Irish-American Festival, "Crossroads," reading from Everything Irish and other books. lest the gravy drown thee!" 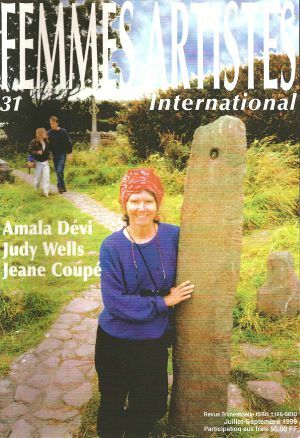 ﻿Copyright 2015 by Judy Wells. in there to keep him company. your classic "I told a lie in confession." and this is what makes you a poet. "It didn't really get into the house." once more in quest of my ancestors. not knowing the dead was with us all along. "Agnes died on July 22nd while you were away."